New Brunswick, N.J. – In the mid-1970s, only half of all children diagnosed with cancer survived beyond five years. Fast-forward four decades and that figure has improved to 80 percent thanks to advances in pediatric cancer treatment and research. To help further propel these advances, a $1.5 million gift has been given to establish the Embrace Kids Foundation Endowed Chair in Pediatric Hematology/Oncology at Rutgers Cancer Institute of New Jersey. The pledge is the single largest gift ever given by Embrace Kids Foundation. It will enable the Cancer Institute of New Jersey to recruit an internationally distinguished faculty member to lead the team that manages the care of the youngest of patients with cancer and blood disorders and is accelerating pediatric cancer research efforts – especially in the area of precision medicine. “The kids and families deserve top-tier medical care and research. Embrace Kids is a thriving and passionate community with a calling to provide every resource and support possible. This endowed chair is funded in memory of an outstanding doctor and beautiful soul, former Pediatric Hematology/Oncology Chief Dr. Barton Kamen, who would agree the Embrace Kids community is proud of this great accomplishment…but the fight continues,” notes Embrace Kids Foundation Executive Director Glenn Jenkins. Embrace Kids Foundation has a long history of ‘giving,’ as its mission since its inception in 1991 has been to provide support services for families whose children have cancer or a blood disorder. 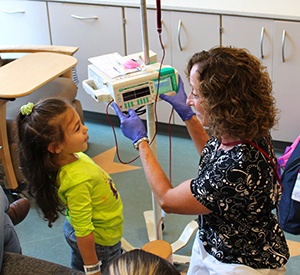 These patients – treated at the Cancer Institute of New Jersey and Bristol-Myers Squibb Children’s Hospital at Robert Wood Johnson University Hospital (RWJ) – benefit from varied programs and family support services including financial and educational assistance, as well as palliative care. Prior to the funding of the endowed chair, Embrace Kids Foundation made gifts totaling more than $2.5 million to various departments now part of Rutgers Biomedical and Health Sciences (RBHS) in support of research, faculty development and support staff including Pediatric Hematology/Oncology at the Cancer Institute. Over the years, Embrace Kids Foundation also made an additional $2.5 million in gifts to RWJ – the flagship hospital of the Cancer Institute – in support of child life, counseling and palliative care. The endowed chair gift to the Cancer Institute comes full circle, as one of the main supporters of the Embrace Kids Foundation is the Rutgers University Dance Marathon, which over the past 15 years has raised $4.2 million dollars for the organization. Under the new chair, precision medicine efforts at the Cancer Institute will be advanced to the next level. Through genomic analysis, this type of research identifies alterations in cancer cells so that targeted therapies can be applied. At the Cancer Institute, this research is taking place as part of a clinical trial that includes pediatric patients who have rare or poor prognosis cancers. DiPaola says the aim is to make genomic analysis a “personalized standard of care” for all patients – pediatric and adult. The Embrace Kids gift helps fulfill a part of the ‘18 Chair Challenge’ – a matching donation initiative under Our Rutgers, Our Future, a $1 billion campaign launched by the Rutgers University Foundation to broaden and enhance the myriad ways the university serves students, the state, and the world. The $1.5 million gift from Embrace Kids creates the $3 million investment needed to support the new endowed chair. “This commitment from Embrace Kids represents a true community partnership. 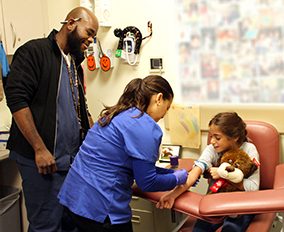 It speaks to the shared dedication of Embrace Kids and Rutgers Cancer Institute of New Jersey in providing comprehensive care to the youngest patients through groundbreaking pediatric cancer research and family and patient services. Gifts like this one signify a remarkable level of support for the community and pride in Rutgers University. Although this pledge is their single largest gift, Embrace Kids has a history of strong philanthropic commitment totaling more than $2.5 million to RBHS since 1993,” says Rutgers University Foundation President Nevin E. Kessler. The Cancer Institute of New Jersey Network is comprised of hospitals throughout the state and provides the highest quality cancer care and rapid dissemination of important discoveries into the community. Flagship Hospital: Robert Wood Johnson University Hospital. System Partner: Meridian Health (Jersey Shore University Medical Center, Ocean Medical Center, Riverview Medical Center, Southern Ocean Medical Center, and Bayshore Community Hospital). Major Clinical Research Affiliate Hospitals: Carol G. Simon Cancer Center at Morristown Medical Center, Carol G. Simon Cancer Center at Overlook Medical Center, and Cooper University Hospital. Affiliate Hospitals: JFK Medical Center, Robert Wood Johnson University Hospital Hamilton (CINJ Hamilton), Robert Wood Johnson University Hospital Somerset and University Medical Center of Princeton at Plainsboro.